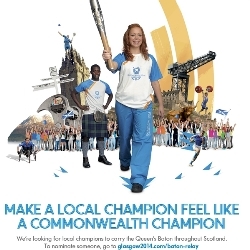 The Queen’s Baton Relay will travel the length and breadth of Scotland in the 40 days up to the start of the Commonwealth Games in Glasgow on 23 July 2014 – and 4,000 batonbearers are needed to complete the journey. The online community batonbearer programme was launched on 10 October and will remain open for nominations until 17:00 on 22 November. Members of the public have the opportunity to nominate a deserving individual from their local community to become a batonbearer. This is a unique opportunity to have the contribution of your people – be they staff, volunteers or service users –publicly recognised and to raise the profile of your organisation and your lottery-funded project. Community nominations can be made by accessing the online form. Glasgow 2014 Ltd have produced a short digital animation film to showcase this unique opportunity, and help spread the word. It can also be viewed on YouTube.